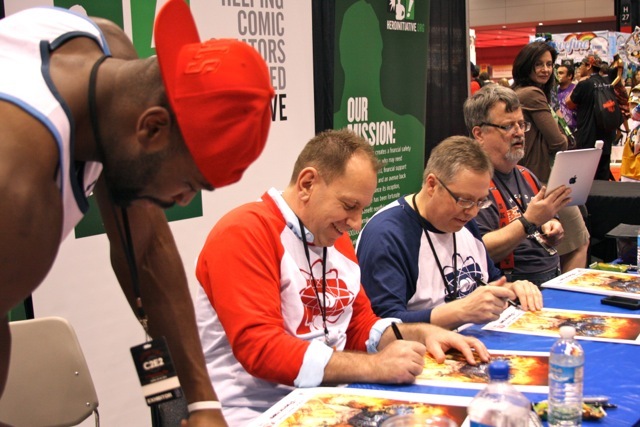 The recent C2E2 convention in Chicago served as the launch for The Protectors #0 from Athleta Comics, the publishing company founded by longtime Chicago Bears player Israel Idonije. The Athleta booth was busy all weekend, thanks in large part (no pun intended) to the presence of Izzy himself, who signed autographs and posed for photos endlessly. 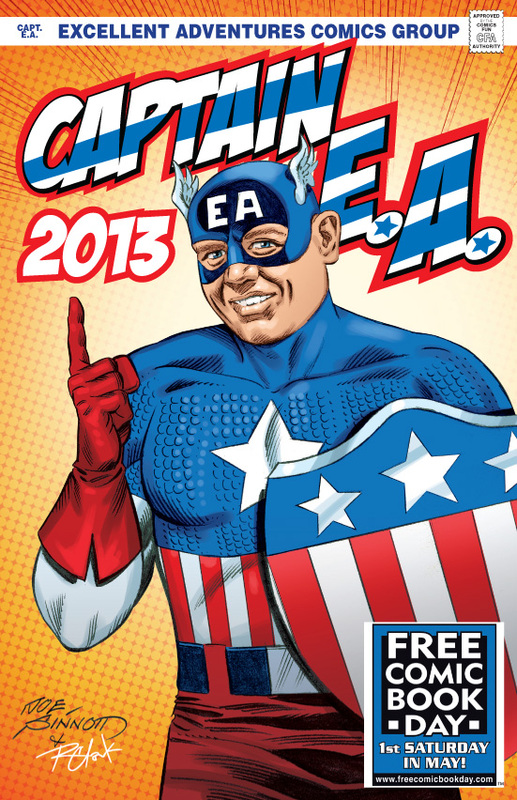 Quite a few of Izzy’s Bears teammates put in appearances, including Brandon Marshall, Corey Wooten and others, as well Shea McClellin, who turns out to be a pretty serious comics fan. 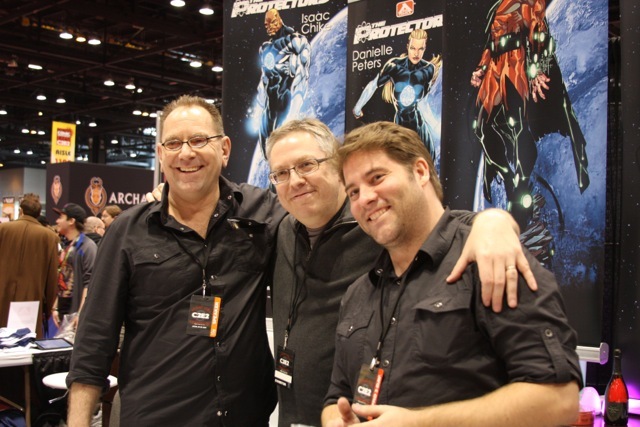 In addition to the #0 issue, the booth had Protectors T-shirts, lithos, and Bart Sears-drawn posters of Izzy’s teammates Brian Urlacher, Julius Peppers and Jay Cutler. 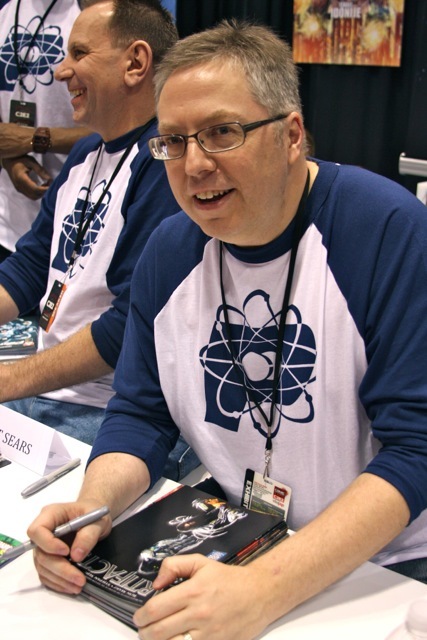 Both artist Bart Sears and I were on hand to sign the #0 issue, as was letterer Troy Peteri. Izzy, Bart and I also appeared at the Hero Initiative booth, signing an exclusive litho to raise funds for comic creators in need. The weekend also featured an incredible launch party at Benny’s Chop House, complete with drinks themed to Protectors characters, an exquisite array of food, a jazz combo and a Protectors ice sculpture. I felt blessed to be able to share it all with friends and family. 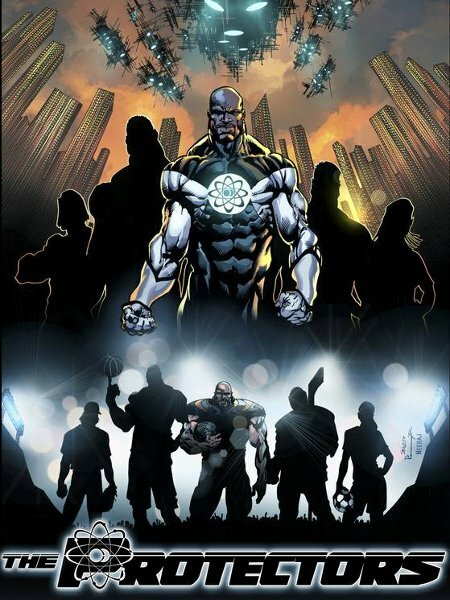 Right now, plans call for The Protectors #1 to be released in September. Two releases this week, one that’s more than 140 pages, the other checking in at a slim eight pages. 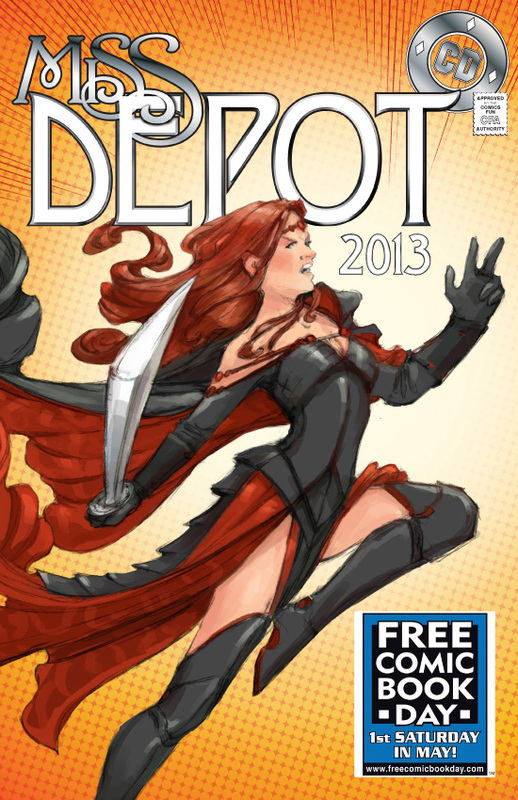 The trade paperback of my seven-issue Prophecy crossover for Dynamite Comics is out today. 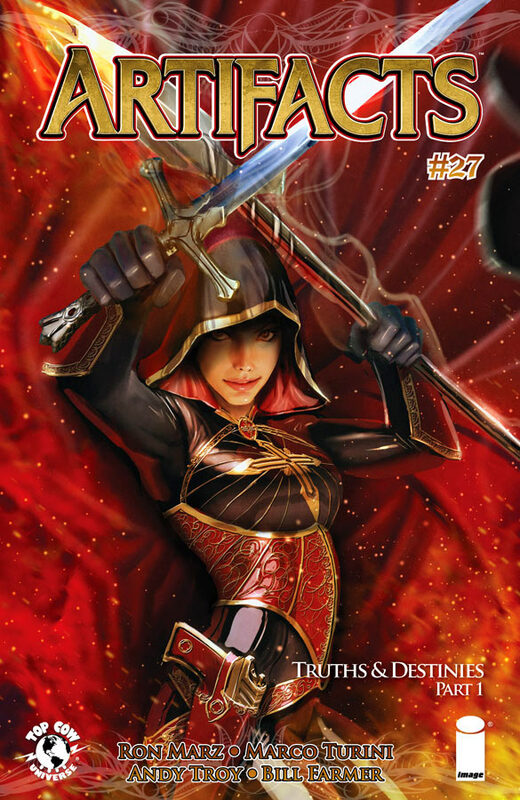 The story features a disparate cast of characters, including Red Sonja, Sherlock Holmes, Vampirella and Dracula, who come together in order to thwart Hyborian Age sorcerer Kulan Gath’s plan to destroy the world. Art is by Walter Geovani, who did a phenomenal job all the way through the series, capturing varying eras and an unlikely group of characters. 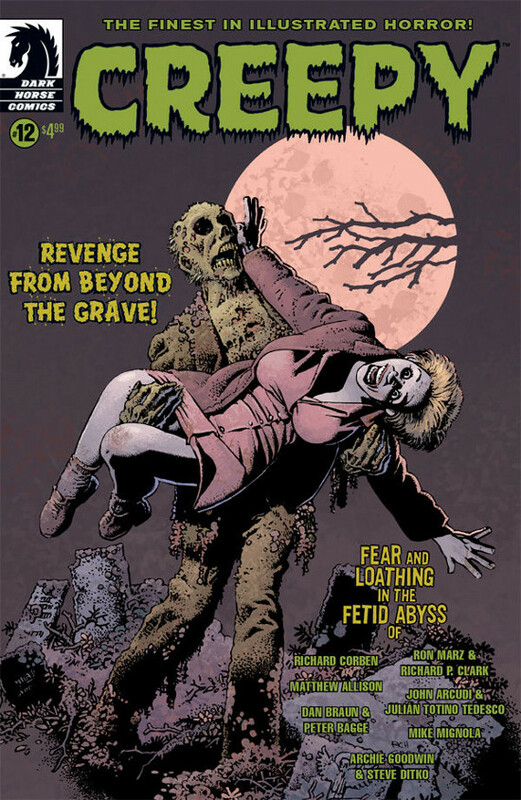 Also in stores this week is Creepy #12, featuring a short story by me and artist Richard P. Clark, wrapped in a Richard Corben cover. Our story, “Fishing,” is a Depression-era tale about two brothers lured into basement of an abandoned house, and what lies in wait for them there.